Scientists at Nanyang Technological University (NTU Singapore) working in the NTU-JTC Industrial Infrastructure Innovation Centre (I3C), call their innovation ConFlexPave, the school announced last week. Polymer microfibers not only enable the concrete to bend and flex under tension but also enhance skid resistance, the team said. While regular concrete can be heavy, brittle and break under tension, ConFlexPave’s bendable and long-lasting properties are able to deliver a variety of benefits to construction teams and end users in a variety of applications, according to the researchers. 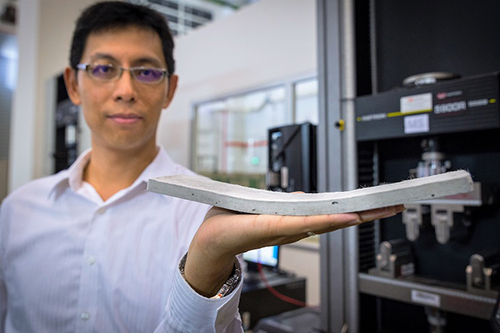 Made of cement, water, gravel and sand, traditional concrete is hard and strong, but a lack of flexibility makes it prone to cracking if too much weight is applied, NTU explained. While traditional concrete tends to be poured thick to help support weight, this new material reportedly has the advantage of being applied as thin, light slabs. ConFlexPave was engineered to mix polymer microfibers with certain types of hard materials. These special synthetic fibers not only enable the concrete to bend and flex under tension but also enhance skid resistance, the team said. “The hard materials give a non-slip surface texture while the microfibers which are thinner than the width of a human hair, distribute the load across the whole slab, resulting in a concrete that is tough as metal and at least twice as strong as conventional concrete under bending,” research team leader Yang En-Hua explained. Yang is an assistant professor at NTU’s School of Civil and Environmental Engineering. A key breakthrough came from determining how the materials interact with one another mechanically on a microscopic level, Yang added. This enables them to deliberately select ingredients and engineer the tailoring of components so the material can fulfill specific requirements for road and pavement applications. The creation of slim precast slabs from this material reportedly halves time needed for roadwork and new construction, the scientists said. “We developed a new type of concrete that can greatly reduce the thickness and weight of precast pavement slabs, hence enabling speedy plug-and-play installation, where new concrete slabs prepared off-site can easily replace worn out ones,” NTU Professor Chu Jian, interim co-director of the I3C, explained. Koh Chwee, director, Technical Services Division of JTC and co-Director of the I3C, noted some additional advantages. The innovation will not only enable the construction industry to reduce labor-intensive on-site work, and enhance workers’ safety and reduce construction time, he said, but it will also benefit end-users by cutting down the inconvenience caused by resurfacing and concrete construction projects. ConFlexPave has been successfully tested as tablet-sized slabs at NTU laboratories, the school indicated. The team plans to scale it up for additional testing over the next three years in partnership with JTC, the lead government agency responsible for the development of industrial infrastructure to support and promote the growth of industries and enterprises in Singapore. The larger-scale testing is expected to take place at suitable locations within JTC’s industrial estates and at NTU, where there will be human and vehicular traffic. “Through collaborations with universities such as NTU in research and development of disruptive technologies, JTC hopes to pioneer cutting-edge industrial infrastructure solutions to address challenges faced by Singapore and its companies such as manpower and resource constraints,” Koh said. The agency intends to make more of its buildings and estates available for testing, he added, noting that, if successful it will work to implement those new solutions.